Why Didnt You Tell Someone ?? These are some of the effects child abuse can have on people, sadly I can place a tick next to most of them even today. Wanting to protect the family or even the abuser(s), who could be either male or female. Child sexual abuse victims may temporarily block memories of what has happened but the effects will surface as they grow. Not talking about what happened will not make it go away but encourages it to fester. Adults often do not talk about child sexual abuse because of their own discomfort with the topic. If adults are not willing to talk about the abuse, the child will probably feel there is something to be ashamed of, that it is dirty and just too awful to talk about. This attitude will only serve to increase the child's feelings of guilt, shame and feelings of being abnormal and will compound their problems. Children often feel powerless to stop the abuse. You cannot be responsible for consenting to an act you did not understand or which you were forced into. There is no easy or acceptable answer to this question. It is impossible to understand how people can treat children in this way, particularly when the abuser is a family member. Sometimes the perpetrators are aware that their behaviour is wrong and their behaviour causes them deep distress. But some believe there is nothing wrong with their behaviour and refuse to accept the damage they cause. Often the abuser has come from an abusive background themselves and this is known as continuing the cycle of abuse. However the majority of survivors do not become abusers. There is no excuse for their behaviour - ever. Sometimes those who abuse do acknowledge the destructiveness of their behaviour and enter treatment. However, the majority deny what they have done which can cause further distress to the survivor who decides to confront their abuser. Sexual abuse is something we often associate with male assailants and female victims, but in reality, an equal (possibly greater) number of boys are sexually abused during their childhood. Whether it occurs in the home, at school, or next door, the memories are permanent and the psychological trauma often carries over into adulthood. The effects of sexual abuse can be exceptionally long-lasting and such trauma is reflected in a man’s personal relationships, though he is unlikely to be conscious of the cause. Emotional unavailability, for example, is quite typical of a male survivor of sexual abuse. These men have great difficulty allowing themselves to trust anyone, which creates tremendous distance between them and the women in their lives. Feelings of guilt and shame, particularly if the sexual abuse took place at the hands of another male, often lead male survivors of sexual abuse to question their own masculinity, which can create a horrific sense of performance anxiety in the bedroom. Recovery does not happen overnight, but it is well within the grasp of any male who has made the decision to empower himself and recover the life that was interrupted during his childhood. It is important to note that neither drugs or alcohol will aid you in this recovery. They may create a temporary state of solace or amnesia, but this can, and often does, lead to addiction which will only compound the initial issue. Therefore, it is extremely important that drugs and/or alcohol not be used as an emotional crutch when dealing with sexual abuse. Loss of memory of childhood. One way of dealing with the pain is to put what has happened out of the mind. If a child has to deny or forget what is happening to him in order to survive the abusive situation, he may find, as an adult, that he has literally lost his childhood, I cannot think back to childhood events without the darker sides overtaking the many good times, its easier to forget it all, which still saddens me. Loss of healthy social contact. When a child feels that the only safety is in isolation, it seriously impairs his ability to respond to others. Protecting himself from abusers by keeping to himself, he also misses out on the possibility of positive, healthy social interactions-with peers and adults. This isolation is often reinforced by the perpetrator. As a way of keeping the abuse secret the abuser may, usually successful, attempt to isolate the child form other people. Whilst I had some great friends at school I found it hard to join in with certain aspects of play, particularly sport, I couldn't handle any kind of close physical contact, it scared me. Loss of opportunity to play. If you ask people what children do with their time, the most frequent answer would be "play." 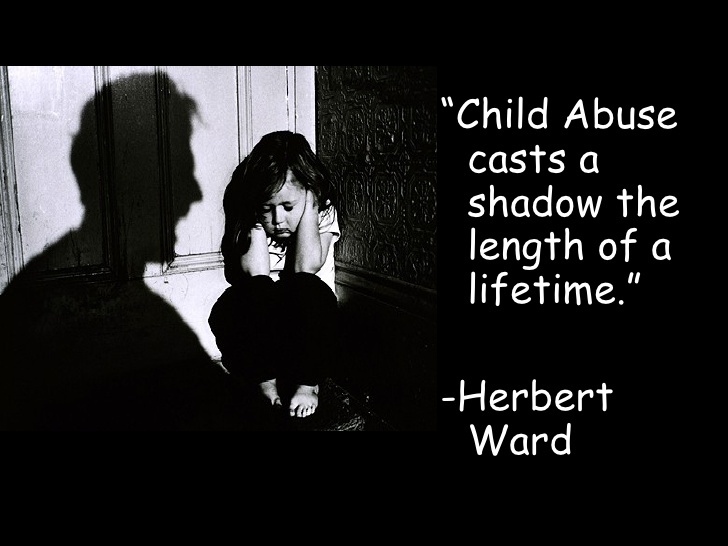 This is not true for many abused children. True play is interactive and requires playmates. He can not relax or trust others enough to enjoy playing. Easy, active, spontaneous playfulness feels too much like loss of control. It seems like such a simple thing, playing, but even at an early stage I felt different. I knew what Egan was doing was wrong and I remember it being referred to as our game a few times by him, this wasn't play or games which made normal play with friends difficult at times. Loss of opportunity to learn. In the course of play children learn to communicate, cooperate, compete, problem solve, coordinate, create and behave in age-appropriate ways. Loss of control over one's body. The most intimate aspect of oneself is one's body. Sexual abuse violates a child's sense of his himself in the most basic way. Someone else takes control of his body against his will. I have always had a weight problem from a very early age, I used to comfort eat to try and numb out how I was feeling, the weight piled on, perhaps an unattractive child would be left alone I thought, what a sad way to think as a young boy. The sad fact is nobody picked up on any of the signs that were there and helped me in my time of need. Loss of normal loving. Childhood should be a time when every child learns that he is good, lovable, wanted, welcomed, and that information, understanding, and protection are available from loving adults. child abuse prevents all of this.